I’m new at planning cross-country cycle trips. Day trips in and around a city, no problem! But traveling on two wheels from town to town is something we’ve only done twice before. 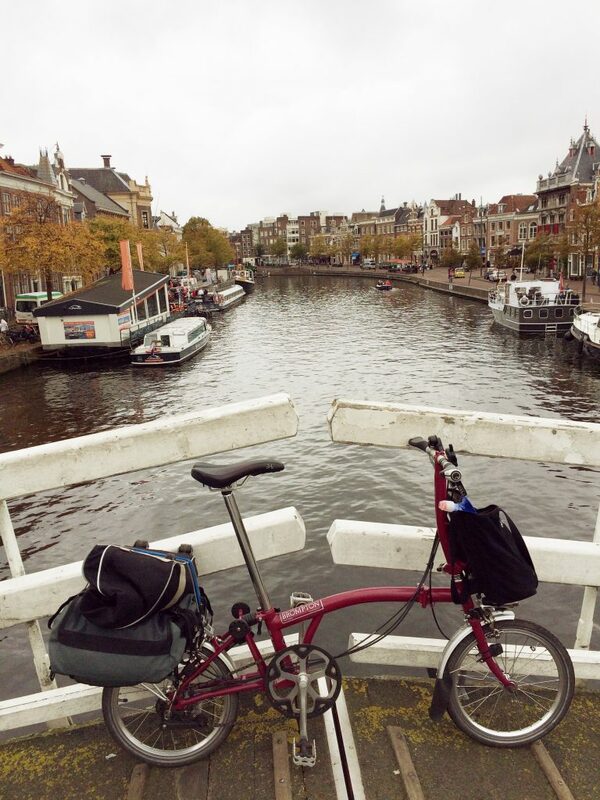 The first time was in Italy from Florence to Rome on a self-guided bike tour. 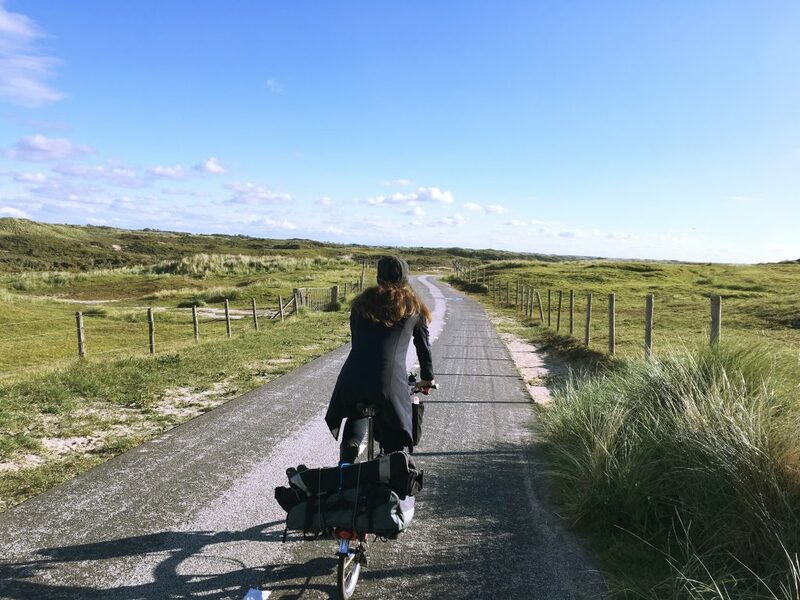 Even though Pier and I were biking alone, the tour company planned the whole route for us and the travel-distance-to-sightseeing ratio was perfect. The second time was in Cuba and we were totally on our own, but were following detailed instructions in the Bicycling Cuba guide book. So on both trips, the actual cycle routes were planned for us. But in The Netherlands, it was all me. 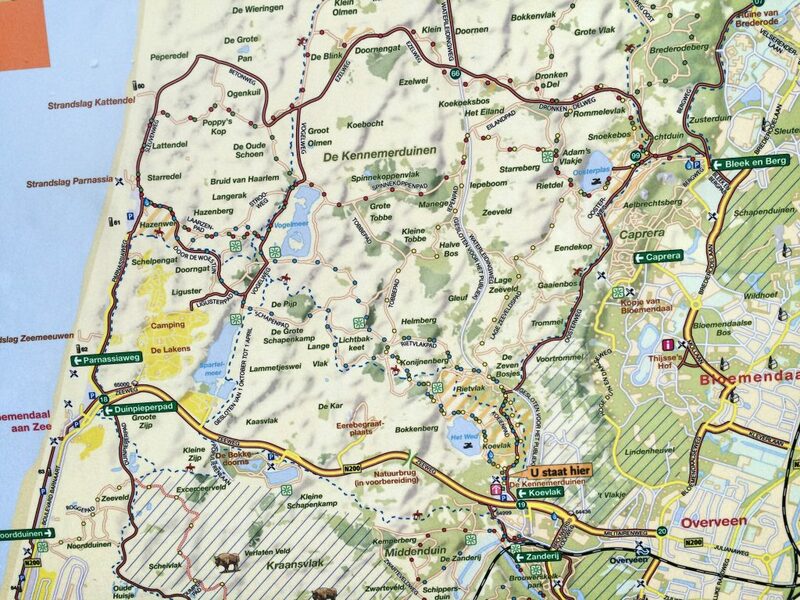 So many bicycle routes! So many places to see! We wanted to do it all! But how much could we see in one day? How far could we ride? 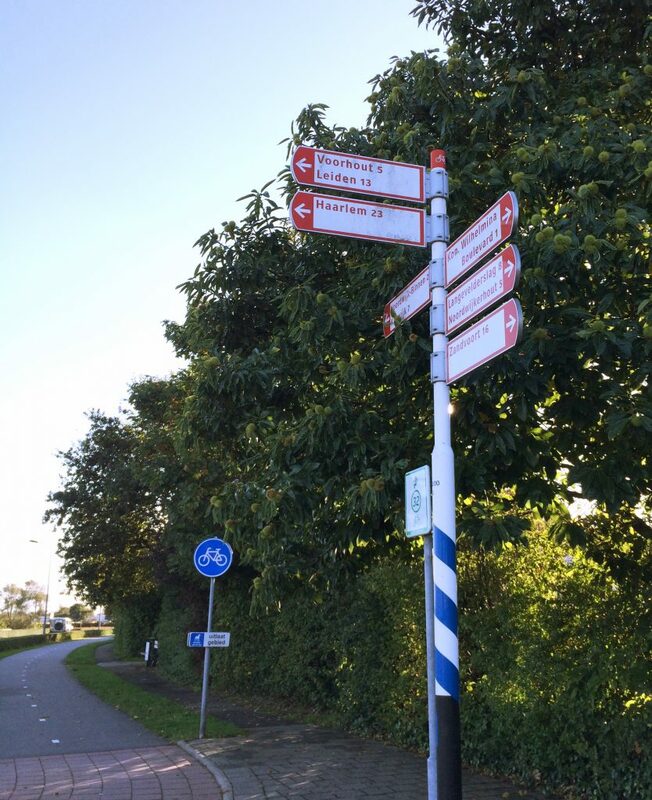 In Cuba we biked almost 100km each day, so I thought a 60km route from Amsterdam to Leiden would be about right. But in Cuba there’s not much to see on those long rides through the countryside, but on this route from Amsterdam to Leiden we had a ton of sights to check out. 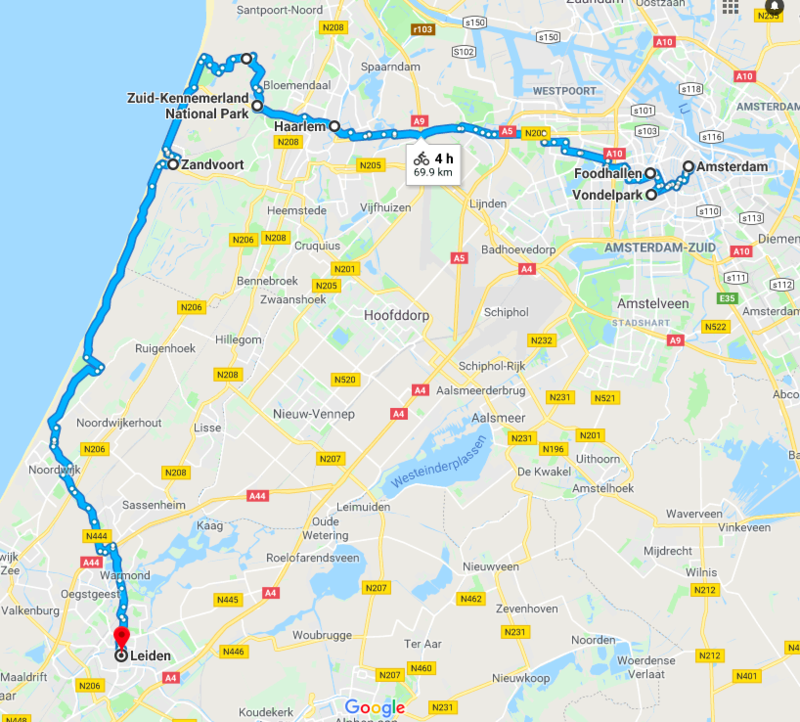 Our route from Amsterdam to Leiden. 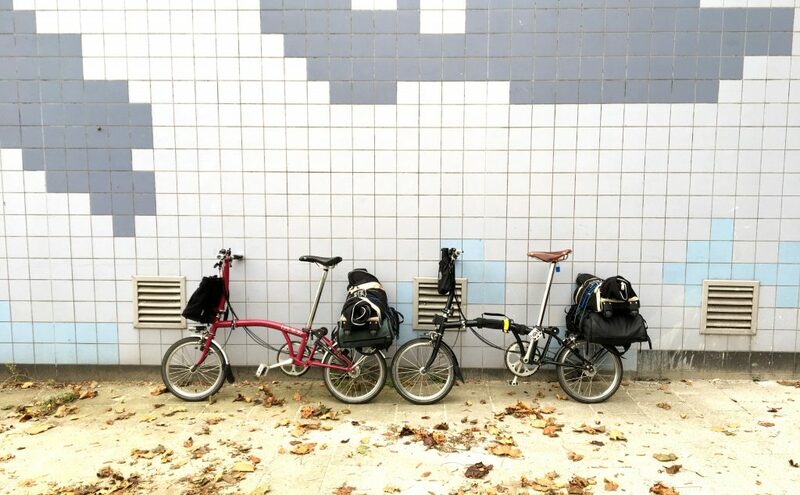 We checked out of our AirBnB at 10am, our Bromptons loaded down with all our luggage (30L backpacks and rolled up B-bags on the back racks). 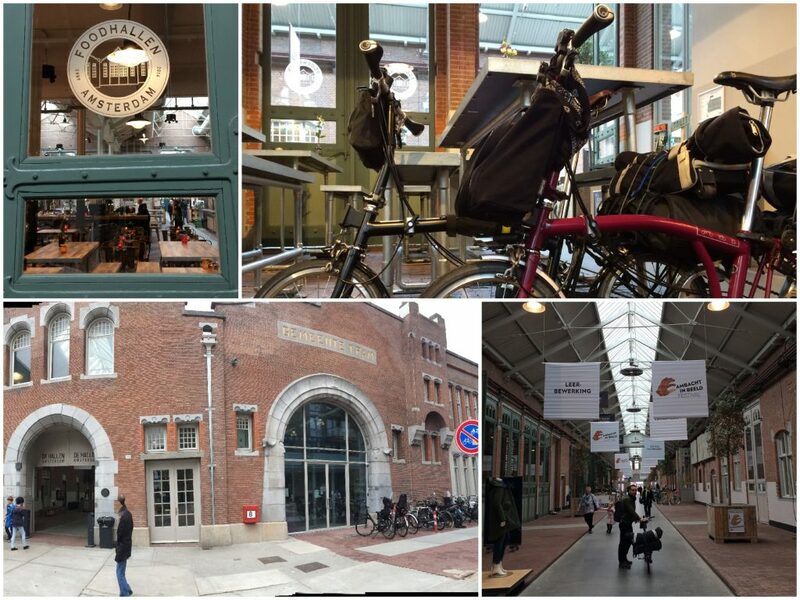 We couldn’t leave Amsterdam without saying “hi” to the nice people at the Brompton Store! So we stopped in for a visit. 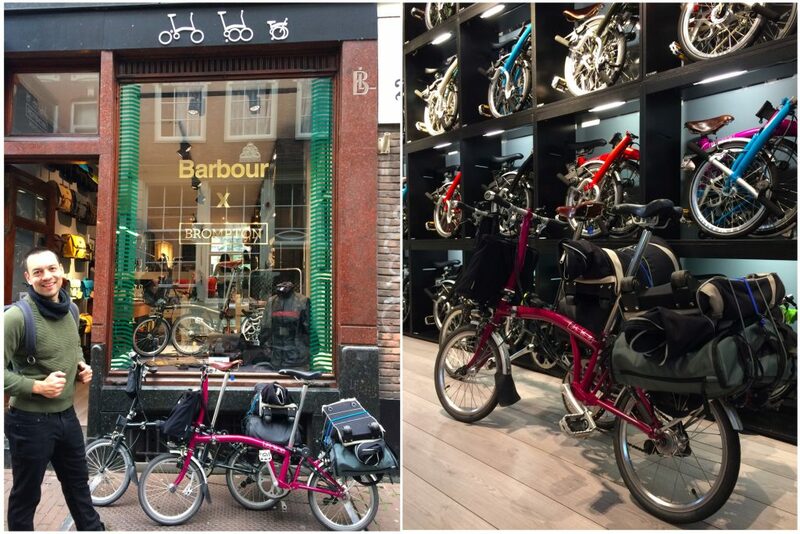 Travel Tip: If you’re visiting Amsterdam and don’t have a Brompton of your own, you can rent one from this store! … and up to Ten Katemarkt (street market) outside of De Hallen. 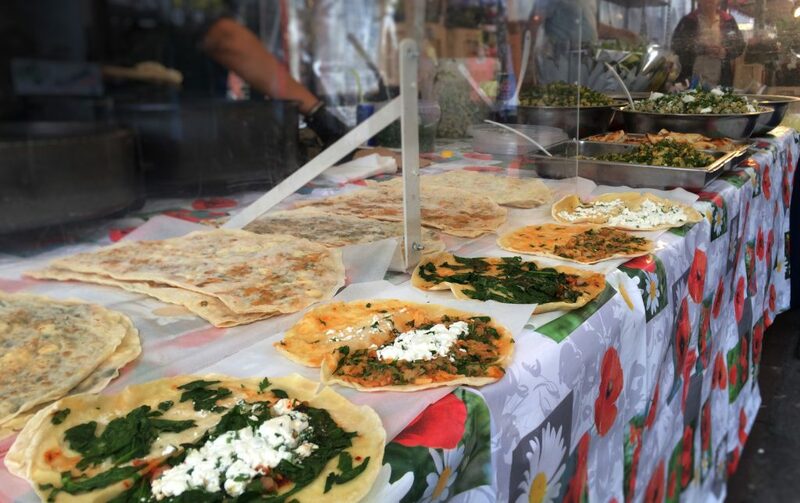 We ate these delicious crepes for mid-morning snack! Then we went inside to check out De Hallen. 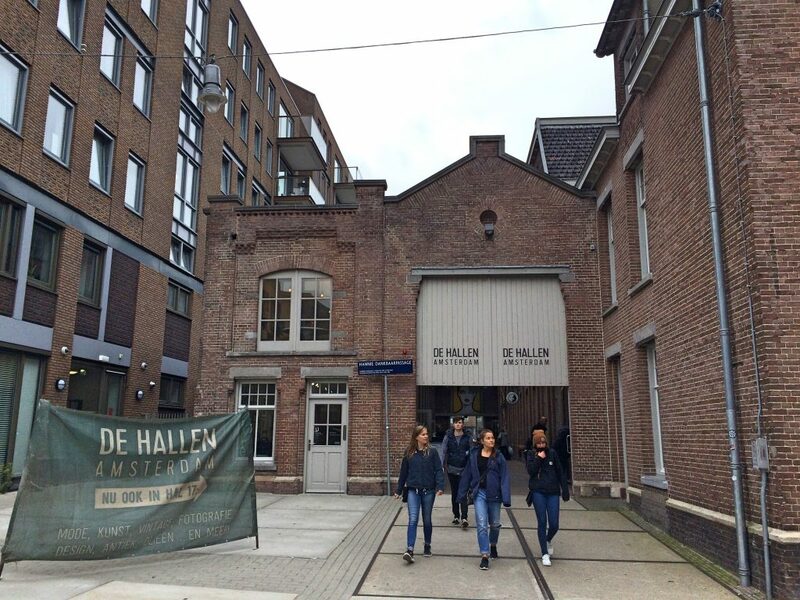 De Hallen is what Lonely Planet calls a “cultural complex” – it has a food hall (Foodhallen), restaurants, design shops, boutiques, a library, a cinema, and of course a bike shop. But what’s especially neat about it is that the buildings are old, converted tram sheds. 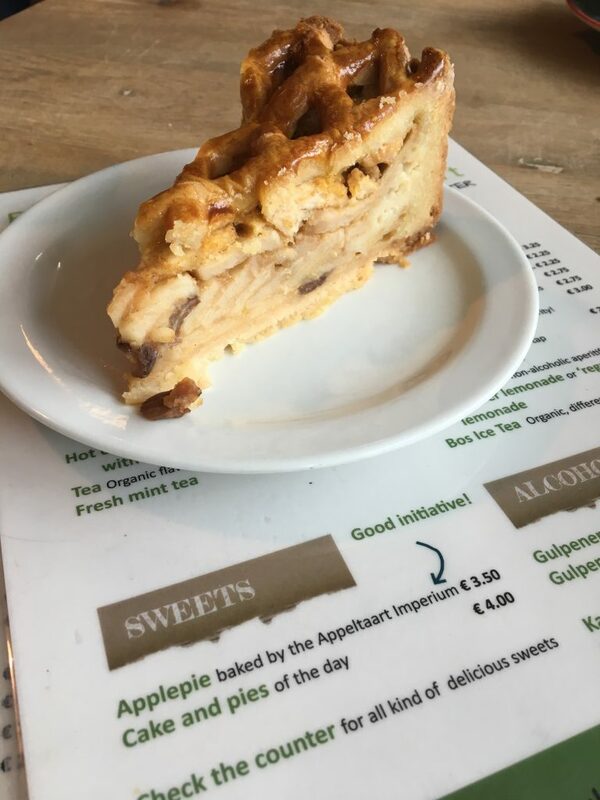 After having another snack in Foodhallen (biking makes us hungry! 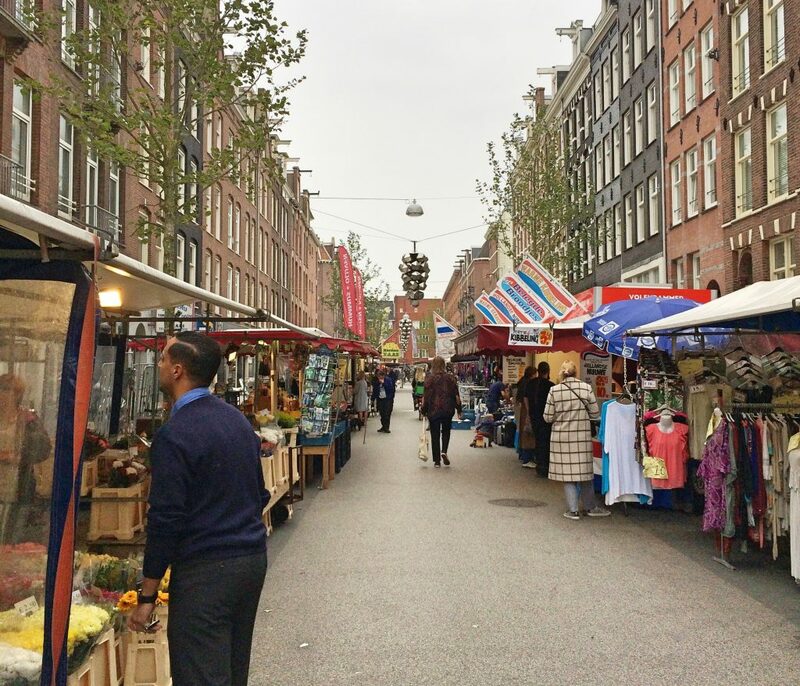 ), we headed west through Amsterdam’s suburbs, which for a couple from North America was actually quite interesting. The suburban sprawl outside of Toronto is made up of large arterial roads lined with big box stores and local streets that wind through mazes of single family homes. The far distances between homes and stores/businesses makes walking impractical, and the lack of cycling infrastructure makes riding a bike not super safe. 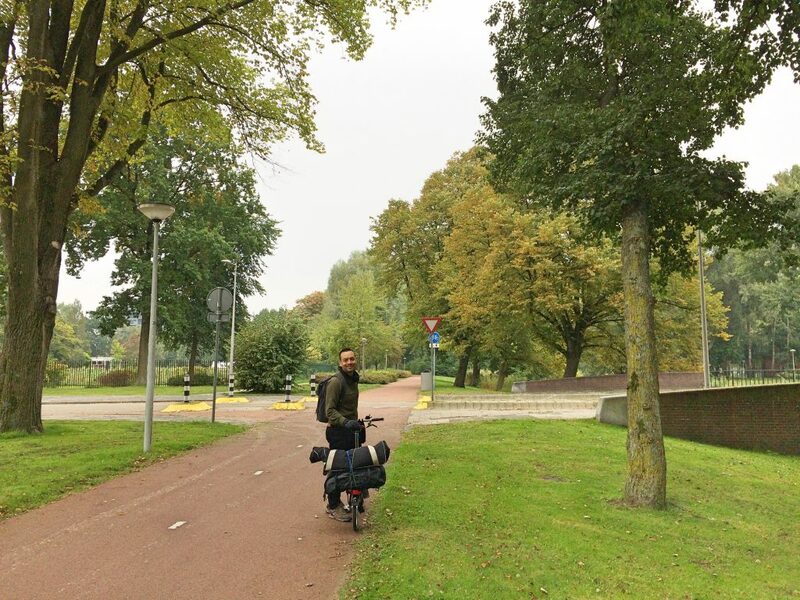 But Amsterdam’s suburbs were nice and compact, made up of townhouses and low-rise apartment buildings, and outfitted with just as many bike paths as car roads. Cyclists, scooters and mini-car drivers all use the bike lanes in Amsterdam. 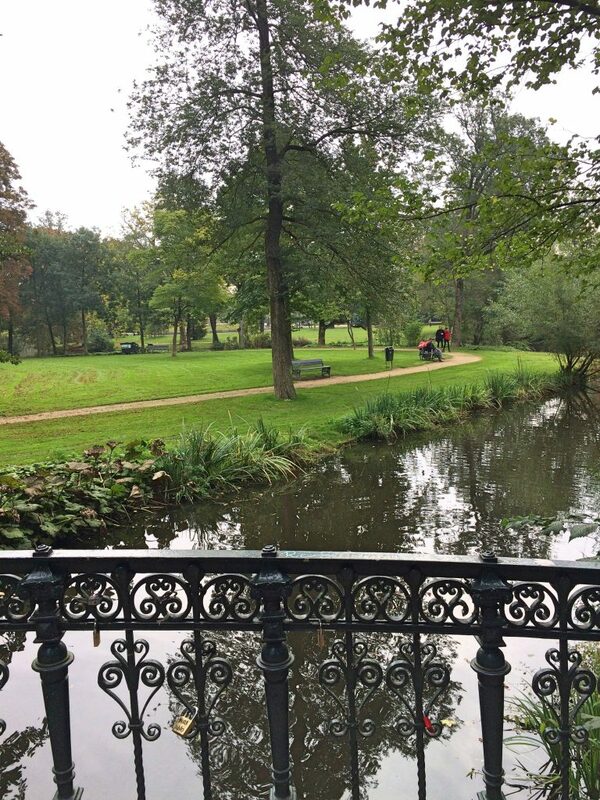 Amsterdam’s suburbs have pretty canals too. 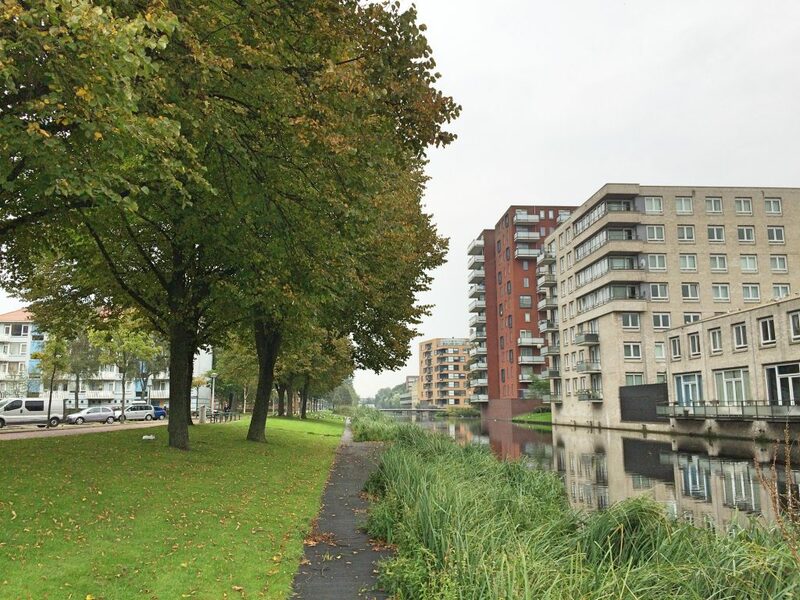 Yes, this excellent bike path surrounded by greenery is still in Amsterdam’s suburbs. 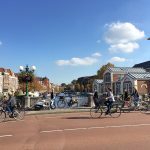 It wasn’t long before the bike path led us to a cycle route that runs parallel with the highway, and in about an hour we were in Haarlem! 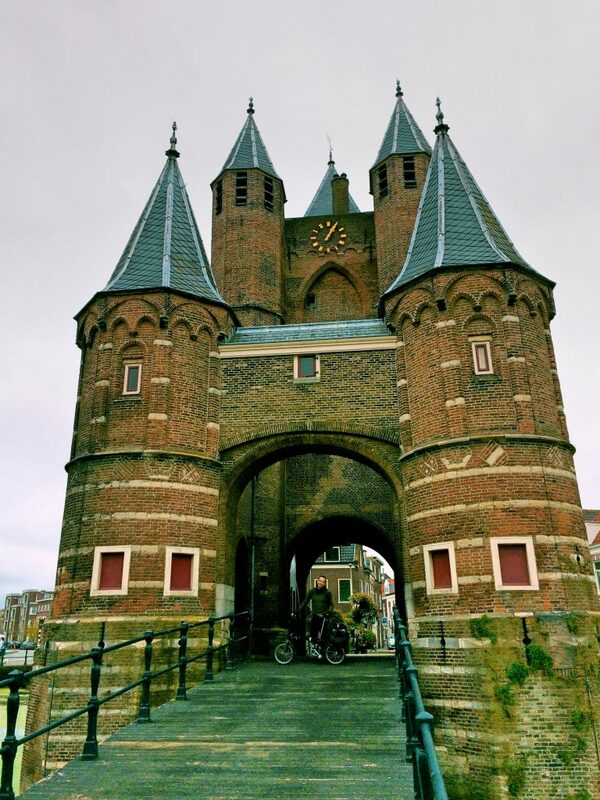 Entering Haarlem through the Amsterdamse Poort. Brommie on bridge over the Binnen Spaarne canal. Pier in Haarlem’s Grote Markt square. Heather in front of St Bavo Cathedral. 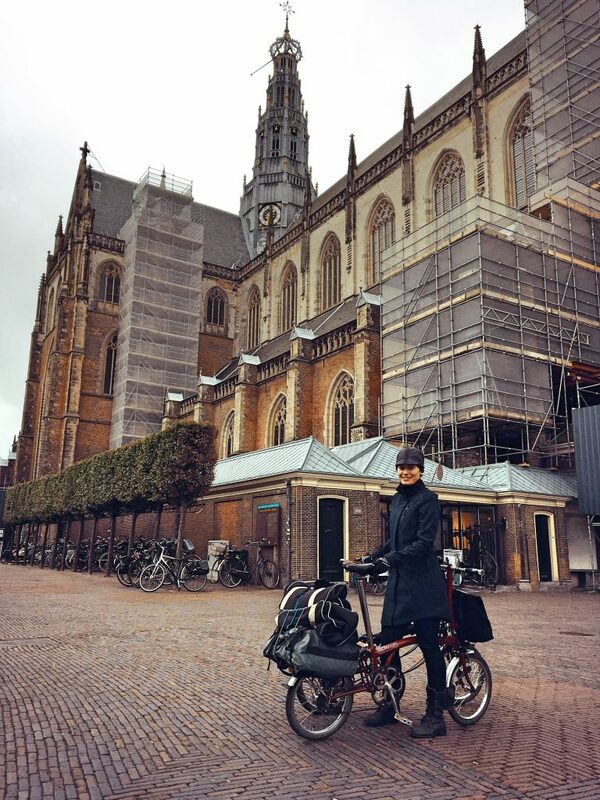 Because our bikes were loaded down with bags, we didn’t go inside any shops or museums, though I did pop inside St. Bavo Cathedral to see the famous organ once played by Mozart. Pier was nice enough to stay outside and guard our stuff. 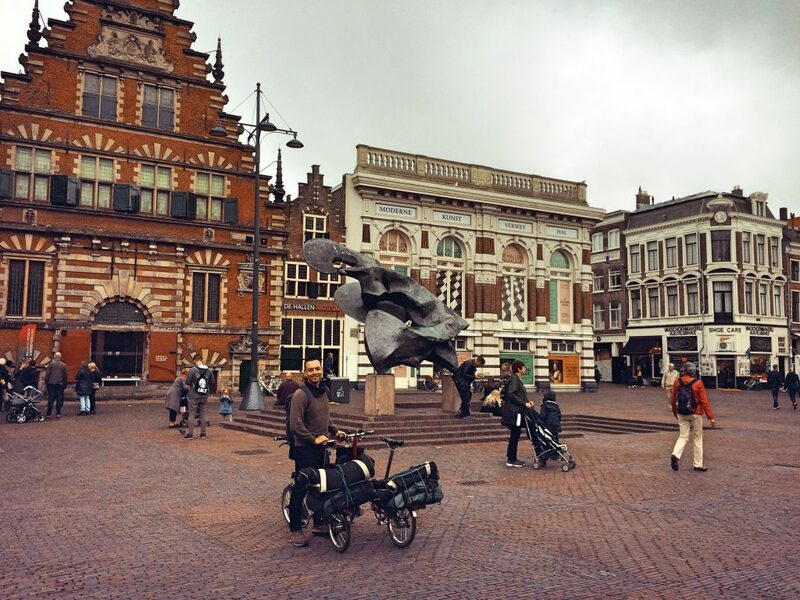 Travel Tip: To explore Haarlem more freely, store your bags in a locker at the train station. 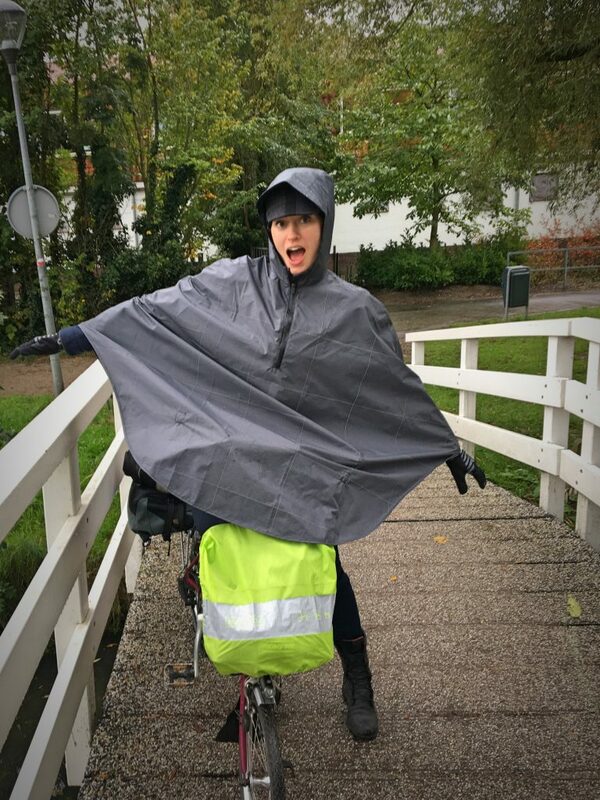 Rain capes are THE BEST! But by the time we arrived at the National Park less than half an hour later, the rain had stopped. 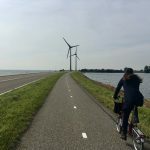 Appetites satiated, we headed into the park (admission is FREE) and followed the bike path north towards Oosterplas lake and then west to Vogelmeer and the coast. Even the National Park has cobblestoned bike paths! Pier at Ooserplas in Zuid-Kennemerland National Park. This was a little scary, but these beasts were cool with us cycling past them. 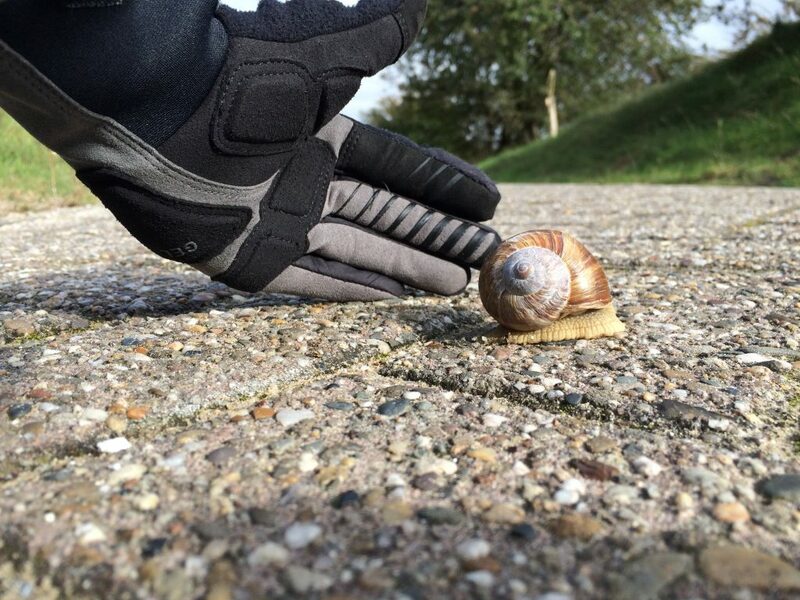 Biggest snail I’ve ever seen! Cycling around the park added another 10km to our trip (for a total of 70km), but it was a lovely, scenic ride and worth the detour. If we’d had more time, we could have explored the entire 35km circuit and gone farther north to see the highest dune in the country and the WWII cemetery. Perhaps next time. 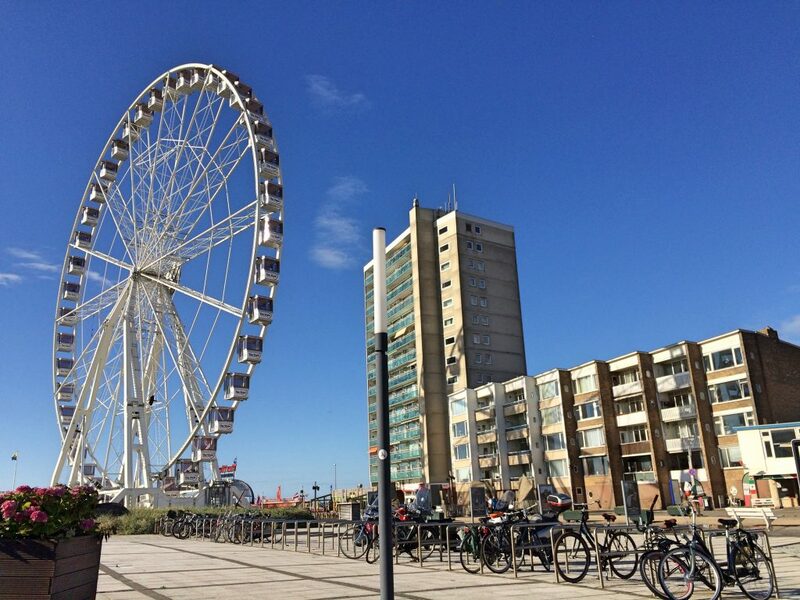 Zandvoort is a beach town. There’s not much to see here except apartment buildings and hotels and a ferris wheel. But the beach is beautiful! Even though the weather was warm for September in The Netherlands (+17C), that wasn’t warm enough to entice us – or anyone else – to go for a swim in the North Sea. We rode through town, stopping to take a picture of the ferris wheel and continued on our way. This was the nicest part of the day’s ride! Heather cycling on the LF1 North Sea Cycle Route. 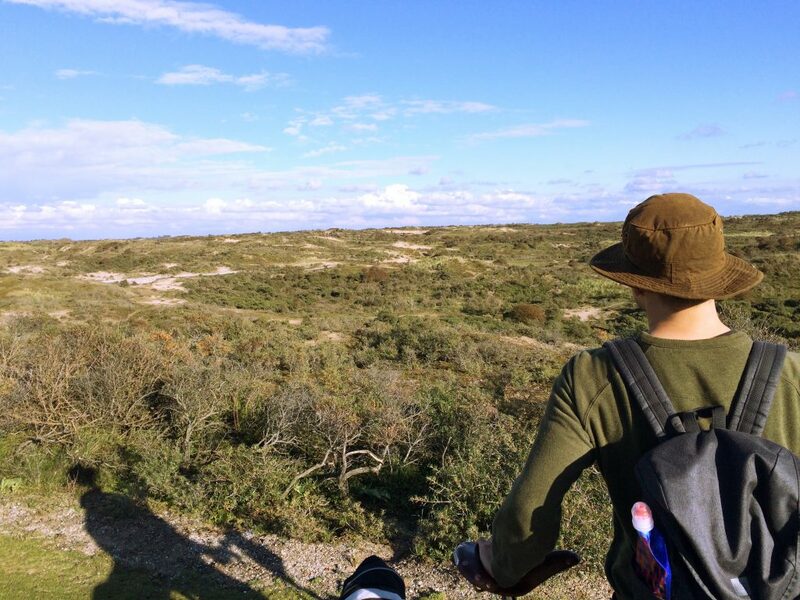 The North Sea Cycle Route south of Zandvoort doesn’t give you a view of the sea; instead you’re riding between the sand dunes. There are footpaths along the route if you want to hike up a dune for a view of the sea, but late afternoon was upon us so we didn’t take the time to do that. Besides, we were enjoying the dunes. Pier looking inland at the dunes. 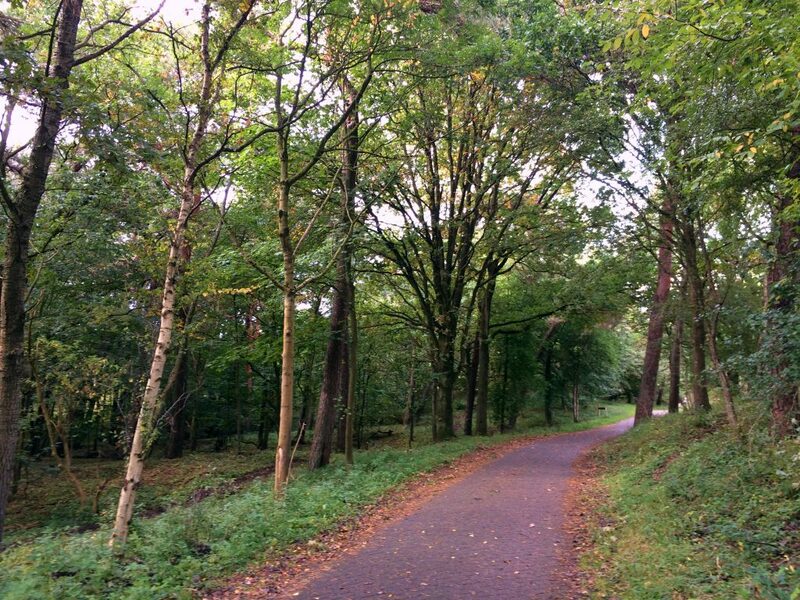 We were also having a great time picking up speed along this smooth, paved cycle path! Even though the cobblestone trails in the park were in good condition, they’re not as smooth as pavement, and it was heaven to be able to race along this part of our route. 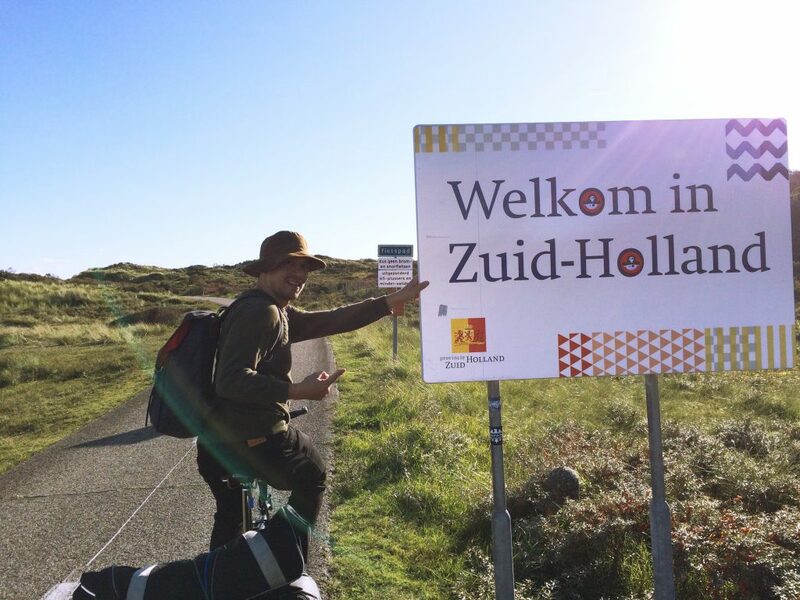 Halfway along the LF1 from Zandvoort, we crossed into South Holland. After that, the route got a little complicated. You Are Here… Okay, but where do we go??? 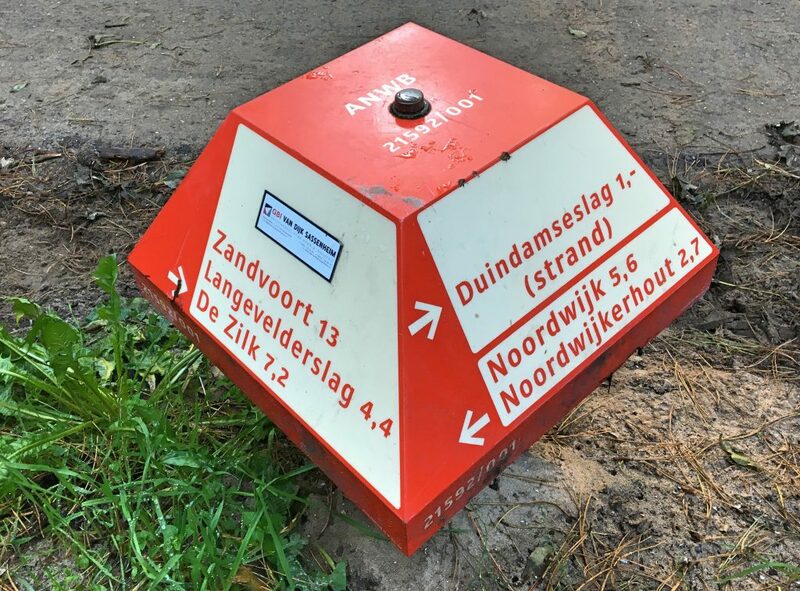 The arrows to Haarlem and Leiden point in the same direction, but those two towns are in opposite directions! Whaaat?! In hindsight, I now understand that there are hundreds of bike routes to get to one destination, but I didn’t know that then. But more to the point, I was not in the mood for backtracking. It was late afternoon, we were tired and hungry, and wanted to know the shortest, quickest way to Leiden! Luckily, a local cyclist saw us staring helplessly at the signs and maps, wondering which way to go, and pointed us down this pretty path. 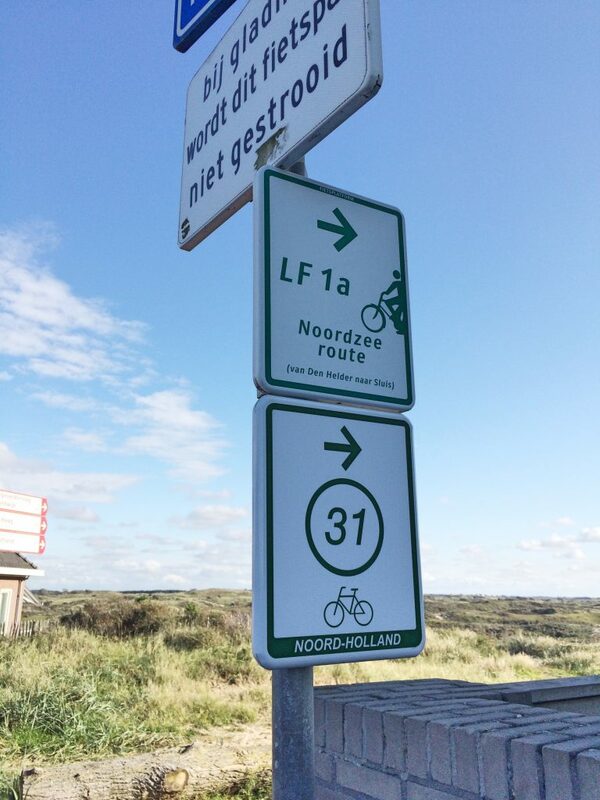 He also told us to follow signs to Noordwijk first and then Leiden. That was helpful. Especially when we found ourselves at an intersection with just this strange little sign. To Noordwijk it was! 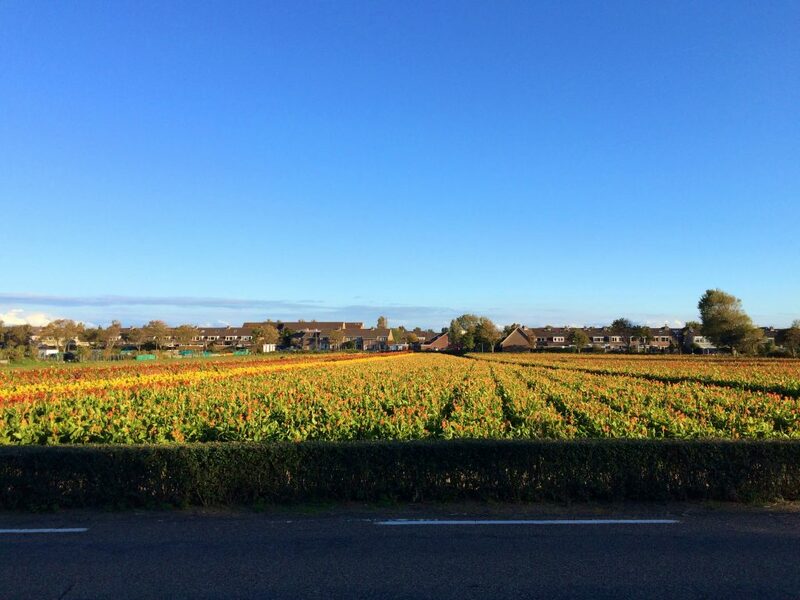 And when we passed what looked like a tulip field gone to seed, we figured we were headed in the right direction. 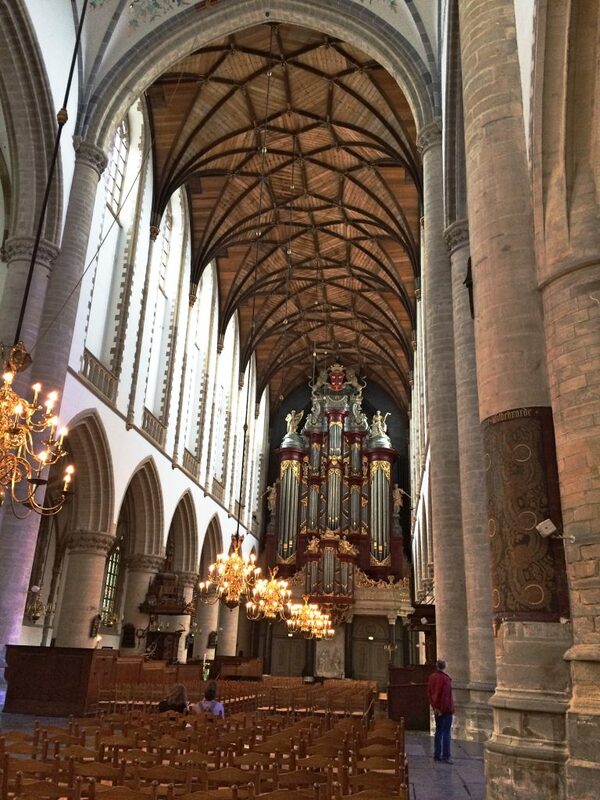 We arrived in Leiden at about 6pm. 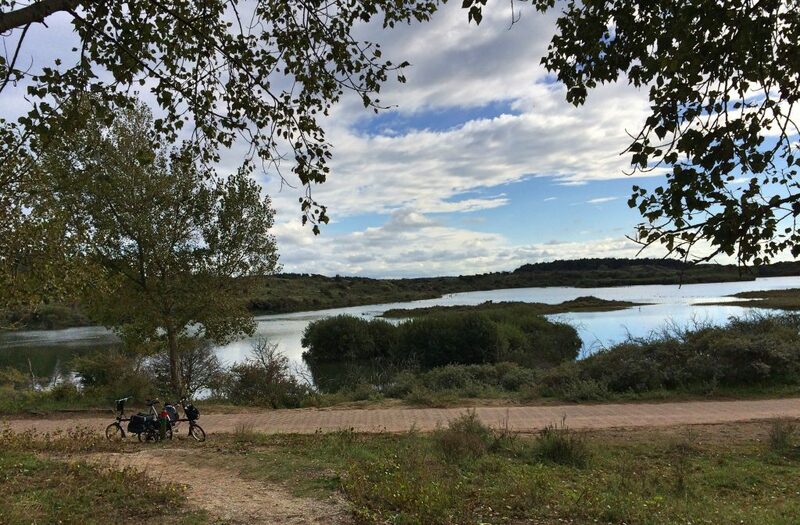 The whole trip took us 8 hours – 4 hours of actual cycling, and 4 hours of sightseeing, eating and stopping to take pictures. 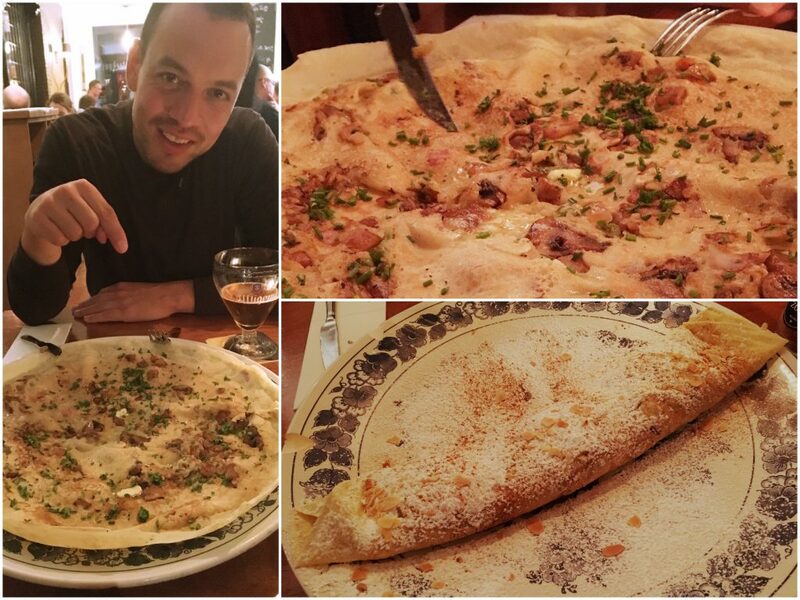 We rewarded ourselves with a dinner of Dutch pancakes! Stay in Haarlem the night before. 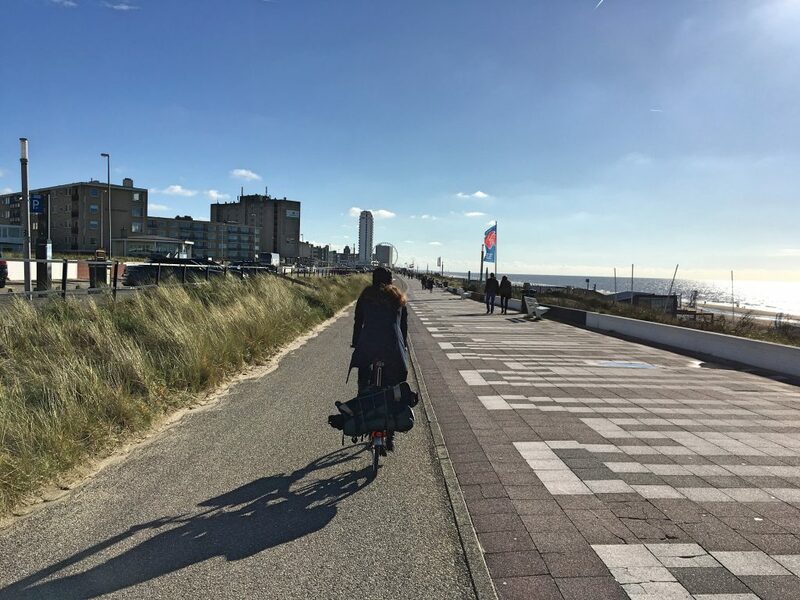 Then the next morning you can leave your bags at the hotel and explore the town’s sites on foot, without carrying bags or locking up bikes. 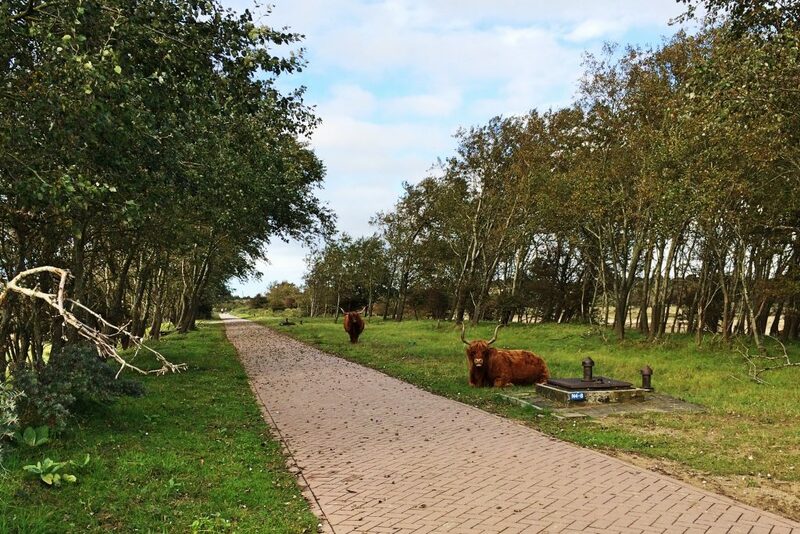 This will give you more time to explore Haarlem and Zuid-Kennemerland. 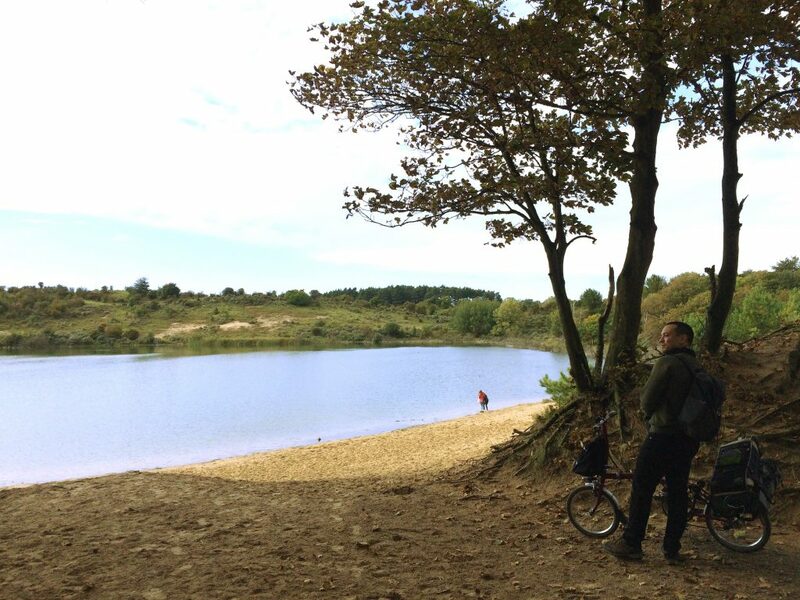 If you love nature, allow at least 2-3 hours to explore Zuid-Kennemerland National Park. We were there for just an hour and missed a lot of what the park had to offer. If you’re traveling in the summertime, you might even want to explore the park for the whole day! There are places to swim and hike and even go horseback riding. If you start this tour in Amsterdam, you can free yourself up to sightsee in Haarlem by leaving bags in lockers at the train station. We didn’t go to the Haarlem train station, but if the lockers are as big as the ones we used in Belgium, you’ll easily be able to fit your Brompton inside too. 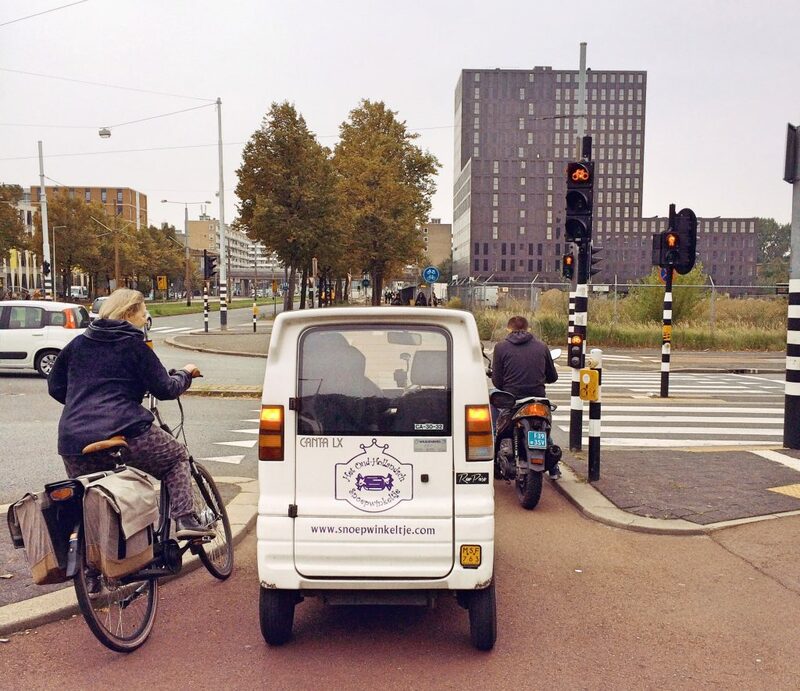 But if you start in Amsterdam, you may not want to push on all the way to Leiden. 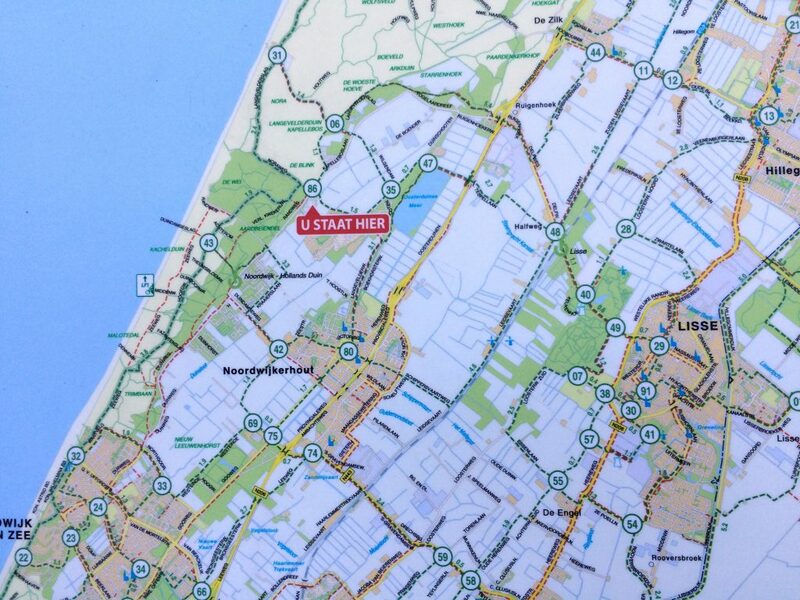 Stay in Haarlem or Zandvoort or even Lisse for the night.